GE 74472 GE240RS-MV-N 120/277-volt Multi-Volt ProLine Electronic Fluorescent T12 Programmed Rapid Start Ballast, 2 or 1 F40 or F34T12 lamps. Programmed Rapid Start T12 Ballast will accept up to 2 or 1 F40 or F34T12 lamps. Accommodates multi-voltages from 120 to 277-volts, extra versatile for your unique projects. High performance rapid start electronic ballast is for all general fluorescent applications. Low profile housing and lightweight for portability. Mounting dimensions: 8.9-Inch L x 1.1-Inch W, Mounting slot set 1.06-Inch apart. Multi-Volt ProLine T12 Electronic Fluorescent ballasts meet the Dept. of Energy minimum ballast efficiency requirements. 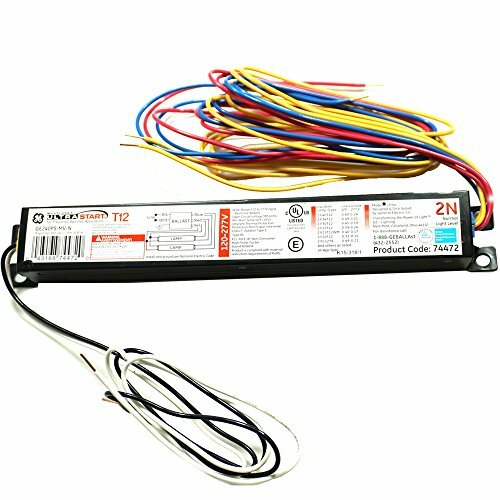 Multi-volt and dedicated voltage ProLine T12 ballasts may be used to replace existing magnetic T12 electronic ballasts during maintenance or retrofits. Parallel lamp operation keeps the unit maintenance easier to manage, if one lamp fails others will stay on. Unit provides auto-restart functions and thermal protection. T12 ballast sound rating: Class A (20-24 decibels). Ballast factor rating of Normal .87 for full light output, ballast factor rating controls light output and wattages of each lamp, a lower BF will reduce light output and wattage of each lamp, meaning more lamps would be needed to achieve a certain foot-candle level in the same area. UL Type 1 Outdoor, UL Type HL, UL Class P, ETL NRCan, CUL Listed, and ROHS Compliant - Industry standards for safety and performance.